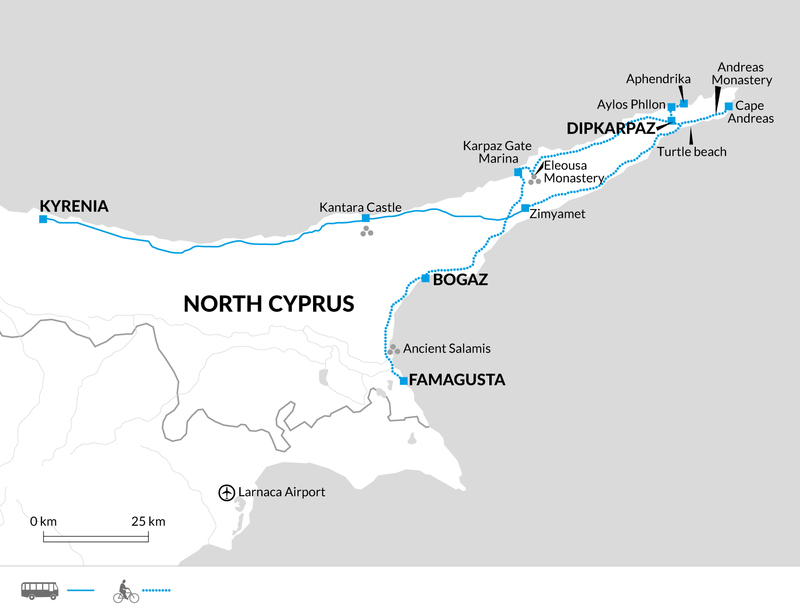 An off-the-beaten-track cycling holiday in North Cyprus. Enjoy cycling along the sparsely populated Karpaz Peninsula, past lemon and orange groves, through old villages and fishing harbours from Famagusta to Zimyamet. Turkish hospitality - Delicious food and 340 days of sunshine a year. Arrive to Ercan (North Cyprus) or Larnaca (South Cyprus) airport, where you can be picked up and driven to your hotel in the historic centre of Famagusta. Famagusta was once one of the richest cities and most important trading ports in the world. The so-called 'City of 365 Churches' has been ravaged by severe wars and earthquakes throughout history, but still contains beautiful examples of medieval and gothic architecture. William Shakespeare is said to have used it as the setting for Othello and the Venetian Citadel, overlooking the harbour, is popularly known as Othello's Tower. Today we collect our bikes and try them out with an orientation ride round Famagusta. We will explore the old town with its Ottoman mosques, Gothic Crusader churches and Venetian fortifications before heading to Palm Beach. Palm Beach is overlooked by the ghost town which has been left uninhabited since 1974 when 40,000 residents of Famagusta fled as Turkish troops advanced, leaving the town as the emblem of a divided Cyprus. The once restort is cordened off from the public. 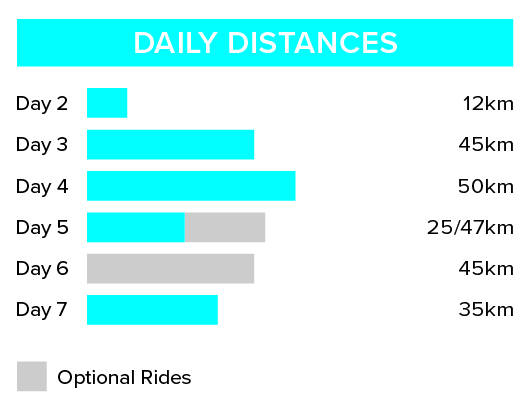 Your total cycling distance today is approximately 12km. Today we cycle out of Famagusta through the university campus, heading north to Saint Barnabas monastery then the ancient site of Salamis. Salamis with its significant collection of Mycenaean, Roman and Byzantine artefacts is the most important ancient city on the island, a local guide will show us round the site helping to bring the history to life. Explore the attractive combination of ruins, sandy dunes and sea panoramas. In spring the area is covered by the yellow blossoms of the acacia bushes. We stop here for lunch and a swim in the sea. Then we cycle on to our final destination for today Bogaz, a small fishing village with excellent fish restaurants. Cycle across the Karpas peninsula, olive, carob and fig trees edge the wayside. The traditional villages you cycle through are adorned with bougainvilleas, hibiscus and jasmin. Stop at one of the coffee houses for refreshment and a rest in the shade. After a long ride, spend the late afternoon relaxing at our beach front hotel in Eleousa on the north coast. Here you can enjoy a sundowner with great views over the Med, maybe try Raki or the national drink Brandy Sour. Cycle along the north coast then inland, to Dipkarpaz, the last village on the panhandle. Dipkarpaz is home to North Cyprus's largest community of Greek Cypriots, who chose to remain with their Turkish Cypriot neighbours after 1974, and their whitewashed Orthodox church rubs shoulders with the mosque overlooking the main square. Cycle to the ancient seafront ruins of Agios Philon and to Apendrika, said to have been one of the island's foremost cities, where you can see Cyprus's oldest surviving domed church. We spend two nights in Dipkarpaz. Pedal along the south coast to Golden Beach, the most famous and perhaps the most beautiful beach on Cyprus. The remote, idyllic beach has very few visitors and is the perfect place for a dip in the azure waters. This area is home to a large population of wild donkeys, you might see them playing at the shore. It is one of the very few areas in the Mediterranean where the endangered loggerhead and Green turtles lay their eggs on the beach. Loggerheads nest mainly from the middle of May to about the middle of August, while Green turtles start and finish about two weeks later. Next we cycle to Apostolos Andreas Monastery, a famous pilgrimage site for the Cypriots coming from the South. Cycling further on to Cape Andreas, the north-easternmost point of the island where once an Aphrodite temple greeted the seafarers, also where many shipwrecked on the small islands in front of the Cape. You may see another important resident of the peninsula, the Mediterranean Monk Seal, extremely rare in this part of world. We then cycle back to Dipkarpaz. Today you cycle through an idyllic landscape of quaint villages and fruit orchards to the south coast of the 'panhandle'. Once we reach Ziyamet we leave the bikes and drive via Kantara Castle to the harbour town of Kyrenia. Our last night is spent here where you can sample some excellent North Cyprus food and explore the town's beautiful and eclectic mix of Venetian facades, mosques and minarets. Kyrenia is particularly famous for its 'picture postcard' vista of its striking Crusader castle and old harbour set against the dramatic backdrop of the Besparmak Mountains. The climate in North Cyprus is generally very favourable. Typically mediterranean, North Cyprus has very hot dry summers and cooler, yet still pleasant, winters. Temperatures mid summer could reach into the 40s with the lowest temperatures in winter around 15 degrees. We recommend you bring padded cycle shorts and quick drying cycle shirts for the daily cycling. Soaked cotton clothes tend not to dry while cycling. Cycling gloves are strongly recommended as they will protect you from sunburn and may also help protect your hands if you fall. A jumper or fleece is also advisable for the evenings as temperatures can drop sharply. A raincoat is advisable for early spring and autumn as there may be sporadic rain showers. Although entirely voluntary, tipping is a recognized part of life in this region of the world. Some local staff will look to members of the group for personal recognition of particular services provided. In order to make things easier for you, the Explore Leader may organise a group's tips kitty and if this is the case, they will account for it throughout the trip. Accordingly you should allow at least GBP 20 for tipping local crew. Travellers Cheques can be exchanged at local banks, however this may be difficult and the exchange rate will not be as good as cash. Northern Cyprus: Visas are not required by UK, EU nationals, Australian, New Zealand, US and Canadian citizens. Other nationalities should consult their local embassy or consular office. On this tour we cycle 177km over five days (an average of 35km per day), with the option of cycling a furthuer 70km over days 5 and 6. We generally cycle on quiet tarmac country roads with little or no traffic. The Karpaz penisisular is a relatively flat region but there are some hills the largest being on day 7 of around 350m. We have graded the route as easy to moderate. Your included bike will be a 26 gear Marlin Trek mountain bike with front suspension and will be the correct frame size for your height. A water bottle holder is included as well as the facility to fit your own pedals or saddle if you wish to bring them. The support vehicle does not accompany the rides but can be called on in an emergency situation. We provide spare parts and take care of the day to day maintenance. All you need to bring is your own helmet.